Swedish massage techniques use long, smooth strokes, kneading, friction, and rocking motions to ease muscle tension in the body to relax and distress the body and mind. Deep tissue massage uses slower and more direct pressure to release chronic muscle tension. Specific areas such as shoulders, low back, and hips can be addressed using Trigger Point and Myofascial Release techniques. Fascia is the connective tissue that covers all muscles and organs. Stress and restricted posture cause the fascia to clump and form adhesions. At the center of these adhesions are nodules called trigger points, which exist in a network throughout the body. They keep muscles contracted, restricting blood flow and compressing nerves which create pain and emotional discomfort. Trigger Point and Myofascial therapy use direct pressure on these points as well as broader strokes to release adhesions in fascia, relax muscles, and invoke deep states of relaxation. Thai massage is preformed on clothed individuals on a mat without oil. Rhythmic and sustained pressure are used on points along the body’s energy channels to stimulate the body’s natural curative abilities. Passive stretching is also used to open the joints and allow for increased circulation. 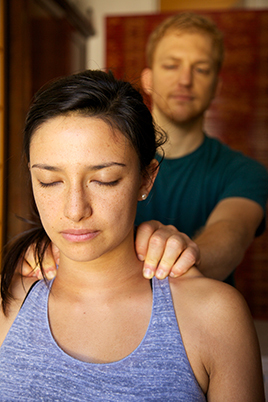 Thai massage bodywork relieves stress and tension to rebalance the natural energy flow of the body. On-site chair massage is available for corporate and private events. See Rejuv At Work. Serge leads massage workshops for groups wishing to learn techniques. See Stanford Workshops.